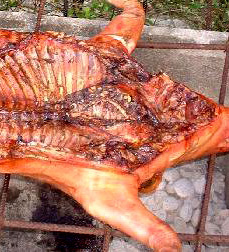 I recently consulted with a Puerto Rican restaurant owner about roasting pigs. He is well-known in the San Antonio Puerto Rican community for his food and caters pigs often. So, I figured I better consult with an expert. He said that roasting such a large pig for a get-together like mine, or as a hobby, should be a great experience. As a restauranteur, however, roasting large hogs is unprofitable. So, he normally sticks to the smaller variety (25-40 lbs.). His explanation as to why, however, befuddled me (you like that word, don’ cha?). A hog this size has more fat than a smaller pig. Leonel said that people are very concerned about their health these days (hmm, this is San Antonio, one of America’s fattest cities, remember?) and thus, the large hog is not as popular. I’m not totally convinced of this explanation. People who order roasted pig are probably not so conscientious of their diet. I mean, goodness gracious, San Antonio is built on corn tortillas and refried beans. I mean, a bean and cheese taco is nothing more than lard inside lard (with cheese on top). But even more disturbing was his assertion that non-latinos (my term, not his) are not very interested in the crispy pork skin produced by these larger hogs. Can this really be true? One of man’s greatest achievements to food-kind is the ability to turn pork skin into something crispy and delicious and succulent and…and…oh, I’m out of breath and I can’t think of any appropriate enough adjectives. If Anthony Bourdain was there he would have had a heart attack (that’s probably coming anyway, if you are familiar with his show). Well, for those of you who have eaten at my home, you know that I’m all about pushing people’s paradigms about what they like or dislike, or what they THINK they like or dislike. But maybe I shouldn’t let the cat out of the bag (or the pig off the grill, if you like). The more people that enjoy the skin, the less I get to eat. That’s ok, I’ll get mine. I have been Jonesing for some well-made, crispy and tasty pork skin (chicharrón to you gringos). About the only way to get it is to make it yourself. So, that got me thinking: I should roast my own pig (mmm – pig). Now, this isn’t such an easy undertaking, nor will it be cheap. And I’m certainly not going to roast a 100lb. pig just to get some skin. So, why not turn this into a huge shindig and invite my closest friends and family to enjoy it with me? Thus, our first annual pig roast! As this process progresses, I will update this blog to show you how we’re putting this together. I’ve already spoken to several people about the idea and they are extremely excited, especially my mom. In fact, one of my friends even offered to provide the pig (sweet). For those of you who are invited, you will be receiving regular e-mail updates. These updates will probably point back to this blog to give you further details and continue to whet your appetites. This year I’ve decided to roast the pig “a-la-isla.” That’s what I call it, anyway. It will be done Puerto Rican style with many common Latin side dishes. I will be cooking the pig on an above-ground pit, somewhat like a concrete block “caja-china.” If this goes well (and the stress isn’t too horrendous), subsequent years will feature the same pig, but be cooked in different styles: Thai, barbecue, Hawaiian, etc. Keep watchin’,’cause I think this is gonna be good!